HANOI (Reuters) - North Korea warned President Donald Trump on Sunday not to listen to U.S. critics who were disrupting efforts to improve ties, as its leader, Kim Jong Un, made his way across China by train to a second summit with Trump in Vietnam. The two leaders will meet in Hanoi on Wednesday and Thursday, eight months after their historic summit in Singapore, the first between a sitting U.S. president and a North Korean leader, where they pledged to work toward the complete denuclearization of the Korean peninsula. But their vaguely worded agreement has produced few results and U.S. Democratic senators and U.S. security officials have warned Trump against cutting a deal that would do little to curb North Korea's nuclear ambitions. The North's KCNA state news agency said such opposition was aimed at derailing the talks. "If the present U.S. administration reads others' faces, lending an ear to others, it may face the shattered dream of the improvement of the relations with the DPRK and world peace and miss the rare historic opportunity," the news agency said in a commentary, referring to North Korea by the initials of its official name, the Democratic People's Republic of Korea. The Trump administration has pressed the North to give up its nuclear weapons program, which, combined with its missile capabilities, pose a threat to the United States, before it can expect any concessions. But in recent days Trump has signaled a possible softening, saying he would love to be able to remove sanctions if there is meaningful progress on denuclearization. Trump also said he was in no rush and had no pressing schedule for North Korea's denuclearization, hinting at a more gradual, reciprocal approach, long favored by Pyongyang. The North also wants security guarantees and a formal end of the 1950-1953 Korean War, which ended in a truce, not a treaty. Trump said on Sunday that he and Kim expect to make further progress at this week's summit and again held out the promise that denuclearization would help North Korea develop its economy. "Chairman Kim realizes, perhaps better than anyone else, that without nuclear weapons, his country could fast become one of the great economic powers anywhere in the World. Because of its location and people (and him), it has more potential for rapid growth than any other nation!" Trump said in a tweet. He also said Chinese President Xi Jinping has been supportive of Trump's meeting with Kim. "The last thing China wants are large scale nuclear weapons right next door." In a letter to Trump last week, three Democratic chairmen of key committees in the House of Representatives accused the administration of withholding information on the negotiations with North Korea. "There are ample reasons to be skeptical that Chairman Kim is committed to a nuclear-free North Korea," the lawmakers wrote. U.S. intelligence officials recently testified to Congress that North Korea was unlikely to ever give up its entire nuclear arsenal. KCNA, referring to U.S. fears of the North's weapons, said if this week's talks ended without results, "the U.S. people will never be cleared of the security threats that threw them into panic". Few details of Kim's trip to Vietnam were announced until early on Sunday, when North Korean state media confirmed he had left Pyongyang by train, accompanied by senior officials as well as his influential sister, Kim Yo Jong. In rare, revealing coverage of Kim's travel, the North's Rodong Sinmun newspaper featured photographs of the leader getting a red-carpet send-off on Saturday afternoon and waving from a train door while holding a cigarette. He was joined by top officials also involved in the Singapore summit, including Kim Yong Chol, a former spy chief and Kim's top envoy in negotiations with the United States, as well as senior party aide Ri Su Yong, Foreign Minister Ri Yong Ho and defense chief No Kwang Chol. Other senior officials, such as his de facto chief of staff, Kim Chang Son, and Kim Hyok Chol, negotiations counterpart to U.S. envoy Stephen Biegun, were already in Hanoi to prepare for the summit. Both sides are under pressure to forge more specific agreements than were reached in Singapore. The two leaders are likely to try to build on their personal connection to push things forward in Hanoi, even if only incrementally, analysts said. "They will not make an agreement which breaks up the current flow of diplomacy. (President Trump) has mentioned that they'll meet again; even if there is a low-level agreement, they will seek to keep things moving," said Shin Beom-chul, a senior fellow at the Asan Institute for Policy Studies. 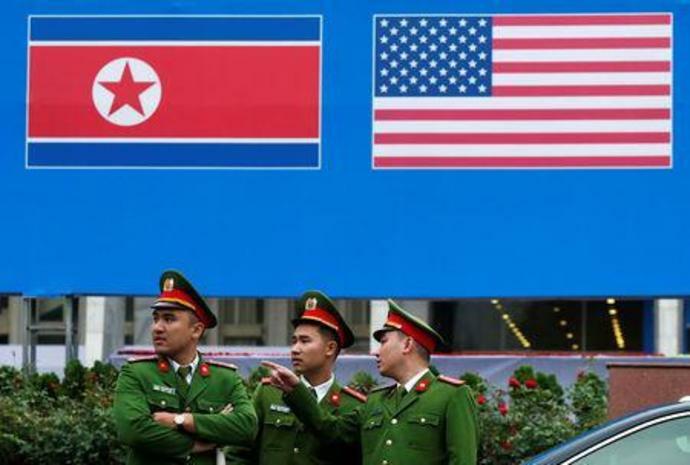 Some lamp posts on Hanoi's tree-lined streets are decked with North Korean, U.S. and Vietnamese flags fluttering above a handshake design, and security has been stepped up at locations that could be the summit venue, or where the leaders might stay. Some carriages of a green train were spotted at Beijing's station on Sunday, but there was no confirmation that it was Kim's. South Korea's Yonhap news agency said Kim's train had passed through a station in China's port city of Tianjin, southeast of Beijing, at around 1 p.m. local time (0500 GMT).